Thanks to the Barcelona Card, you can have access to the best that Barcelona has to offer in the palm of your hand. This fantastic "Pass" which has been created by Barcelona's Tourist Centre, enables visitors to travel for free on all the different modes of public transport, including the Metro and the trains, to and from El Prat Airport. But the beauty of this Travel Card doesn't end here! In fact, those who opt for the 72 hour passes will also have free access to more than 20 museums and discounts on many of the attractions and guided tours. You will find all the information you would need hereunder, together with the reasons why you should choose the City Card. Voucher discounts at many of the city's shops. The 48 hour Barcelona Card has been created for those visiting the city for a short time only or for those who are visiting the city on more than one occasion and are therefore, mainly interested in a ticket that covers the different transport options. 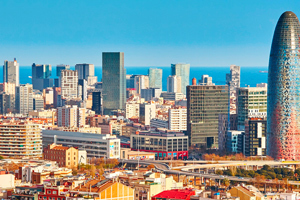 The Barcelona Card includes: unlimited use of the transport systems for 48 hours, (including journeys to and from El Prat Airport), 90 discount vouchers for certain activities, museums and a variety of different attractions and a very convenient map of the city which is always useful for getting your bearings in the labyrinth that is the historic city centre! The 72 hour Barcelona Card has been created for those tourists who don't wish to miss out on anything this wonderful city has to offer. Unlimited public transport (including the Montjuïc Cable Car), transfers to and from El Prat Airport, free access to all the best museums, discounts on all the main attractions and tours, including "Skip the Queue" and a brochure with information about the best things to visit! To summarise, everything, absolutely everything is included! Without doubt this Card has been put together for any tourist who is hoping to get the best out of their holiday in Barcelona. Just show the tickets on your mobile at any of the collection points. In order to collect your Barcelona Card, you will just need to get to one of the Tourist Offices in Barcelona and show the tickets on your mobile. In order to benefit from the card from the beginning of your trip, including transport from the airport, you can pick up your Card at the Tourist Offices that are located in the Airport Terminals (both T1 and T2) or in the atrium of the Metro L9. Alternatively, you can collect your card from the Office at No.17 Placa Catalunya.